On Monday evening at 8:46 p.m., Radnor firefighters were dispatched to lend mutual aid to Berwyn Fire Company at a building fire in the West Valley Business Center in the 900 block of West Valley Road in Tredyffrin Township. Firefighters from King of Prussia Vol. Fire Co., and Valley Forge Volunteer Fire Co., were also called to the scene due to the nature of the incident. According to reports, a PECO employee, who was working in the area due to the recent winter storm, noticed smoke in the building and called 9-1-1. According to Berwyn Fire Company, the Chester County Fire Marshals Office ruled the cause of the fire as electrical in nature. The total damage to the building and contents is estimated at $600,000. 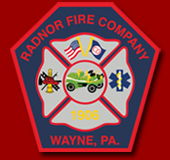 One Radnor firefighter suffered a minor hand injury, but did not require transport to the hospital. All units were cleared from the scene by 11:30 p.m.
Radnor Fire Company would like to thank Springfield Fire Co. and Manoa Fire Co. for their cover assignment at Radnor during this incident.